Have you heard the one about the guys who rode into a campground with a Nomad tent? Oh. They just had a really good night's sleep. The Nomad Ténéré uses three poles, sleeps two, and has one awesome motorcycle garage. After a long, hard ride, you want a nice place for both you and your bike to zonk out. 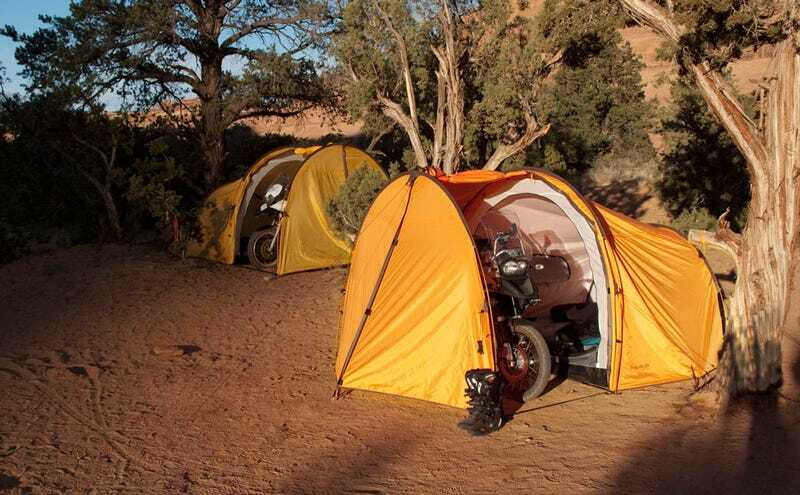 The Nomad Ténéré Expedition Tent, "dedicated to the adventure motorcycle traveler," provides a reliable shelter for two full-size adults—it has 30 square feet of interior room—and also has a sweet garage for one full-size bike. Park the bike, set up the outer sheet of the tent and you are instantly out of the elements for erecting the inner tent. When you are ready to take off in the morning you can pack up the inner tent, the ground sheet and your gear onto the bike all within the comfort and shelter of the outer sheet.